The purpose of the Oklahoma Academic Scholar program is to recognize the outstanding academic achievement of graduating seniors in compliance with State law which became effective in 1986. 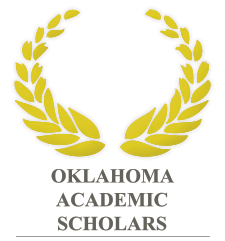 Oklahoma Academic Scholars receive a certificate of recognition from the State Board of Education and the local high school, a gold seal affixed to their diploma, and the honor recorded on their official transcript. Accumulate over Grades 9, 10, 11 and the first semester of Grade 12, a minimum grade point average of 3.7 on a 4.0 scale or be in the top 10% of their graduation class. Complete (or will complete) the curricular requirements for a standard diploma. Achieve a 27 composite score on the ACT or 1220 combined reading and mathematics score on the SAT. The ACT or SAT must have been taken on a national test date or state administered test date. For students with documented disabilities requiring testing accommodations not available on a national or state administration date, a qualifying score on the ACT or SAT may be demonstrated using alternate administration dates. Submissions are due April 30th, 2019.